The next parade will be held on the 22nd April 2019. The famous London Harness Horse Parade will again take place at the South of England Centre, Ardingly, West Sussex on Easter Monday 22nd April 2019. The annual event is an amalgamation of The London Cart Horse Parade (first started in 1885) and the London Van Horse Parade (started in 1904) and depicts transportation through the ages. This makes it one of the oldest and most well-loved carriage driving events in the country. Generations of carriage-driving families make the annual Easter pilgrimage to the Parade and the current President, WA Gilbey, is a direct descendant of the founder of the London Cart Horse Parade, Sir Walter Gilbey Bart. For new exhibitors or exhibitors who have not entered the London Harness Horse Parade within the last 5 years. This will be determined by the Parade Secretary’s records of entries based on the exhibitor and not the animal(s) or vehicle. All entries which qualify will receive a special rosette and a copy of the Centenary History Book “Parade”, in addition to any other prizes. Only entries that come forward for judging at the parade will be eligible for this award. The first 12 eligible entries will receive a refund of £12 towards their entry fee. The following information is for guidance only, the entry conditions that apply will be those detailed in the official schedule. To improve the general treatment, condition and management of horses, ponies and donkeys. To encourage persons in charge of animals employed for transport to take a humane and intelligent interest in their well-being and to show kindliness towards their animals. To encourage and assist all horse-users to achieve a high standard of care, management and cleanliness. Animals will be subject to examination by a veterinary surgeon for condition, soundness and fitness for work. Mares heavily in foal may not be exhibited. All vehicles must be sound and well maintained, suitable for a competent whip to drive on the road. The vehicle must be appropriate to the size and strength of the animal and must not be overloaded at any time. There must be a driver and at least one groom with each vehicle entered. All exhibitors should have experience of driving on public highways. Any entries considered unsuitable may be requested to leave the Parade. Exhibitors must hold adequate public liability insurance and provide evidence of such cover when submitting their entry form. All exhibitors will be expected to take part in the final parade. 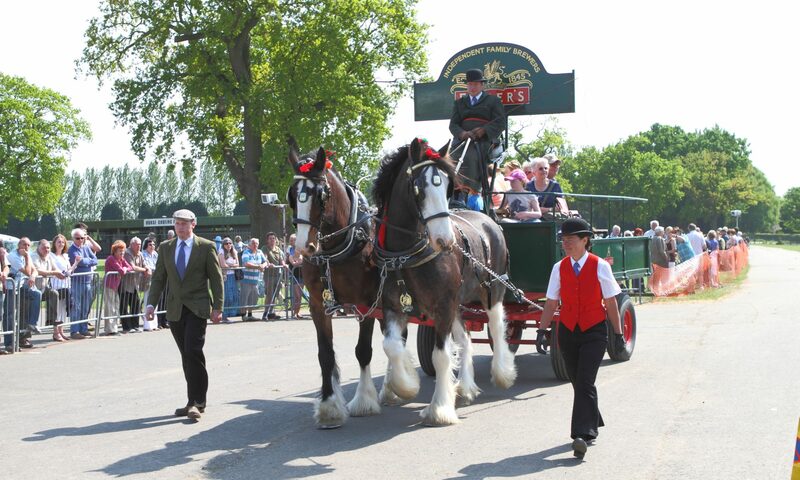 Exhibitors not taking part in the parade will not be entitled to receive their rosette(s) or horse brass. No sulkies allowed under any circumstances. Safety is the first requirement and essential. The horse must be sound, well shod, in good condition, well groomed, and suitable for the vehicle. The harness must fit the animal and vehicle. It should be in good repair and clean. New harness or show harness is not necessary. The vehicle must be road-worthy, sound, properly balanced, clean, suitable for the size of the animal and not overloaded. The driver, groom and passengers should be neat and tidy. Whips should be carried by drivers at all times.